Summer means: Vacations, the beach, and fun in the sun. But it also can mean more risk to your skin, from sunburn and exposure to harmful ultraviolet rays. With Obagi Nu-Derm Sun Shield sunscreen, however, you can let go and relax, assured that your skin is getting the protection it deserves. And now you can get it for 20 percent off at SKIN the Spa at the Runnels Center, when trading in your old sunscreen for Obagi. 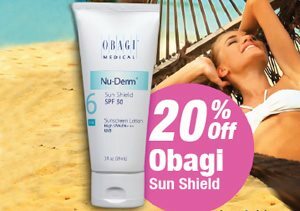 Obagi Nu-Derm Sun Shield protects against the visible signs of aging, caused by sun and environmental damage. It provides UVB absorption in protection against burns and UVA protection against premature aging and skin cancer. The sunscreen is PABA-free, allergy-tested and dermatology-tested, as well as free of any fragrance. It is lightweight, non-oily and glides onto your skin for long-lasting protection. It is designed for any skin type. Just as importantly, Obagi includes prescription-grade ingredients that you will not typically find in a retail environment. Call or stop by SKIN the Spa at the Runnels Center and ask about Nu-Derm Sun Shield today.